The Breville BOV450XL’s power is 1800-watt with 8 pre-set cooking functions such as bake, broil, roast, cookies, reheat, pizza, bagel and toast. These functions come with recommended settings, for example when you do cooking, you do not have to fiddle with temperature and time. There is the LCD display and the temperature and time buttons. You can adjust them by pressing the up and down arrow buttons in between. The LCD display will illuminate with an orange backlight when the unit is operating. The heating elements are located both at the top and bottom of the oven’s interior. The elements are composed of quartz and the reason for this material is that it is more sensitive to heat changes and will offer more even heating throughout the oven. The Element IQ technology in this model helps with the heat distribution too and it will channel heat to where it is needed when a cooking function is chosen. It will also adjust the heat accordingly by increasing or lowering the heat output for different types of cooking. For more flexibility, there is a 3-position rack height for cooking different types of food. The crumb tray is removable from the front. To gauge the size of the interior, the oven can fit 4 slices of bread or an 11” pizza. The oven comes with a baking pan. This mini toaster oven is very quick to heat up with sleek and elegant design around the oven. It is also very easy to use, because it does not require a PHD to figure out how to work. It has a high number of preset cooking functions which can help you tweak the default settings based on your recipes. Although the oven is mall, there are still large enough to be used. If something happened and make this oven is dirty, you will have no worry since this oven is very easy to clean. Breville is a reputable and trusted name for home and kitchen appliances, with a very popular line of toaster ovens. This reputation is important, as you know they have sunk a lot of time into innovating the design, features and build of their products. There is no doubt if you say it as a pretty good toaster oven. It has Element IQ which indeed adds a layer of functional intelligence that other toaster ovens do not have. It is also powerful with a wide variety of cooking settings and easy to clean without take too much space on your countertops. The design of stainless-stell is sleek and modern, fit in nicely kitchens of all decors. With the BOV450XL oven, you get the quality and innovation of a proven brand at a (mostly) affordable price. It is not a perfect oven, but Breville BOV450XL has achieved what it intended to. It is easy to use, easy to clean, and, most importantly, cooks really well. If you are currently on the lookout for a toaster oven, this may just be the best one for you. · Pre-set-times makes you fast and easy to oven or bake something. 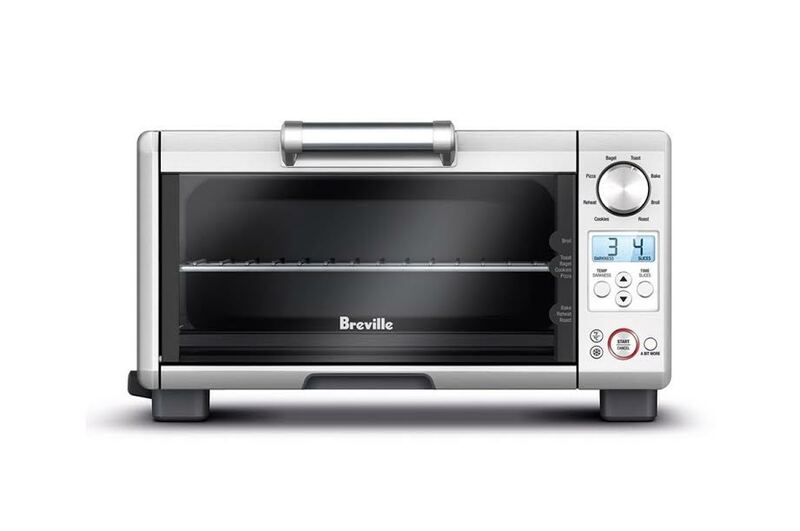 Check the best price for Breville Mini Smart Oven here!